Our outer covers fit snugly over the folded mattress preventing the SNooZA from looking creased or baggy. To take off the cover unzip it completely. Flip the SNooZA back upright. Pull up on all 4 corners (*see diagram 1) and then remove. Fold cover neatly and store. To put the cover back on hold 2 corners and line them up perfectly to the corners of the mattress. Now do the other 2. Pull down on each corner about a third of the way down, two at a time, until the cover is on. Flip over the SNooZA. Work gently when closing the zip. It is important to PUSH IN the inner mattress as you zip the SNooZA closed (*see diagram 2). This prevents the mattress cover from getting stuck in the zip and makes zipping easier. The Inner cover is synthetic. We recommend a cold hand wash. Do NOT iron or tumble dry. Use a mild soapy solution and a soft cloth to wipe off dirt. Do not use abrasive sponges or machine wash as this will damage it. Allow to drip dry. DO NOT IRON. Completely machine washable. Wash separately as the colour will run. Wash on a cold water cycle. Hang on the line inside out and iron to get rid of all creases. After washing, the cover might be tight at first just as it is when putting on a freshly washed pair of jeans. It will stretch with time. Dry clean (preferable) or cold hand wash. Cool iron on the reverse side. Do not tumble dry. Dry out of direct sunlight. Cold hand wash. Dry out of direct sunlight. Iron inside out (if necessary). Machine wash at 30 degrees. Do not squeeze or wring. Do not tumble dry. Avoid drying in the sun. Iron on reverse side – max 110 degrees. Dry cleanable. 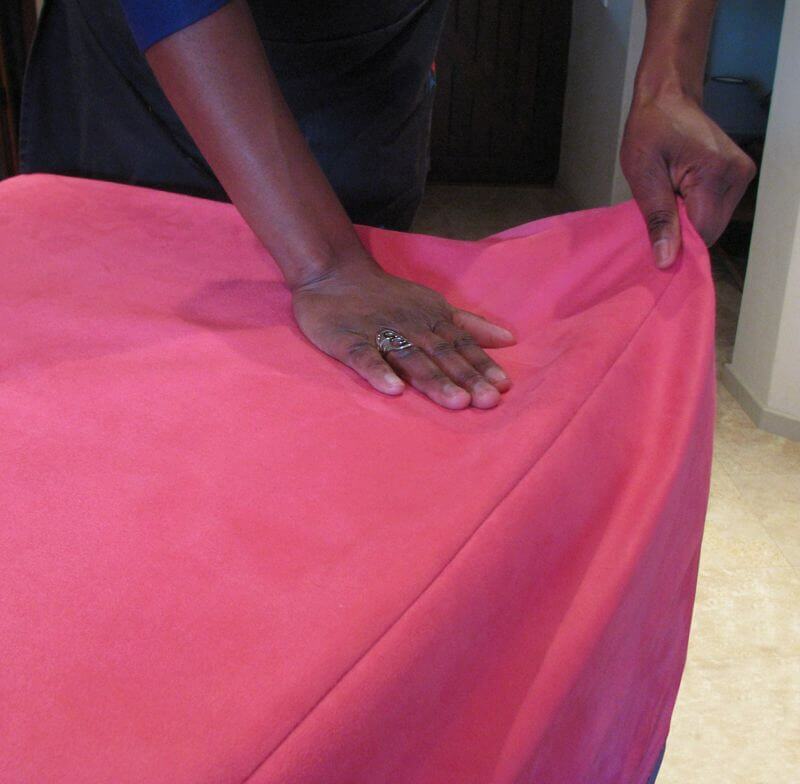 The black synthetic bottom of your SNooZA can be wiped clean with a soapy cloth or hand washed but DO NOT IRON. Do not wash foam. Immersing foam in water will affect the density and shorten its life. Please note – the foam takes approximately 3 months to “settle”. If it feels a little firm at first, give it time. The more you use it the softer it will get. For some, purchasing online is an unnerving experience. You don’t know what you are getting not having seen the product. Well, we offer a full 100% money-back guarantee. As soon as you receive your product you need to let us know if you are unhappy. You have 7 days in which to report faulty workmanship or return your goods UNUSED for a refund. We will arrange for the collection of your unwanted purchase, however it must be returned unused, in perfect order, and wrapped in the original packaging or similar.